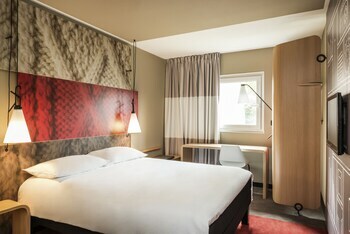 With a stay at ibis Mulhouse Bale Aeroport in Saint-Louis, you'll be within a 15-minute drive of Messeturm Basel and Basel Zoo. Featured amenities include complimentary newspapers in the lobby, a 24-hour front desk, and luggage storage. A roundtrip airport shuttle is complimentary (available on request). Located in Entrecasteaux, this apartment is close to Chateau d'Entrecasteaux and Thoronet Abbey. Free self parking is available onsite. With a stay at Villa Aimee in Vals-les-Bains, you'll be a 2-minute drive from Thermes de Vals-Les-Bains and 9 minutes from Dome Benoit Chapel. Free self parking is available onsite. Located in Mosnes, Villa Vino is within a 15-minute drive of Chateau de Chaumont and Chateau d'Amboise. With a stay at La Mandarine in Piolenc, you'll be within a 15-minute drive of Triumphal Arch of Orange and Jean-Henri Fabre Museum. Free self parking is available onsite. With a stay at this apartment in Thollon-les-Memises, you'll be close to Bernex Ski Resort and Artisan Distillery of Dent d'Oche. Free self parking is available onsite. Located in Saint-Chely-d'Aubrac, Hotel Les Coudercous is a 2-minute drive from Pilgrims Bridge and 6 minutes from Bonnefon Tower. A train station pick-up service is available for a surcharge. With a stay at this apartment in Bordeaux (Bordeaux Historic Center), you'll be within a 5-minute walk of Grosse Cloche and St. Michael Basilica. Free self parking is available onsite.